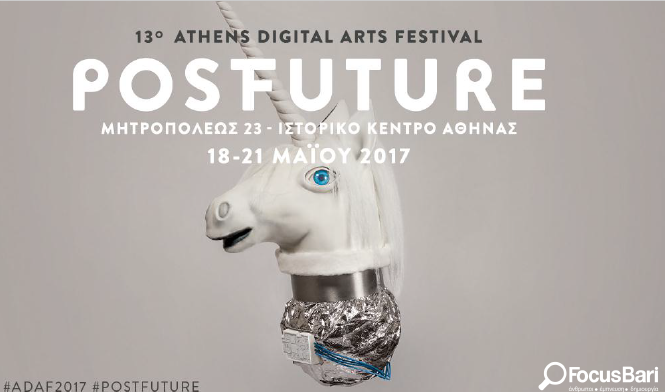 Although the fact that #ADAF2017 has been finished and we already head to the Open Call for artists for #ADAF2018, the last edition of the Festival keeps on contributing to the artistic and cultural happenings of Greece. ADAF in collaboration with the Greek Market Research Company, Focus Bari, conducted a research on ADAF2017’s visitors with rather interesting results regarding their profile and interests. At the same time, on the initiative of Focus Bari, the results were compared with the average Greek attitude towards Technology & Culture, data derived from FocusonTechLife Web (B16). 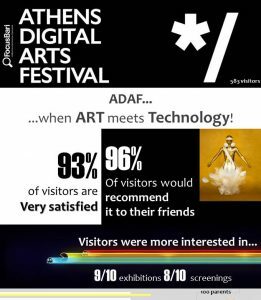 The impact of ADAF2017 is proven by research findings, as 93% of visitors said they were excited and 96% would recommend it to friends. ADAF always aims at being at the center of developments by detecting the trends of society and culture. 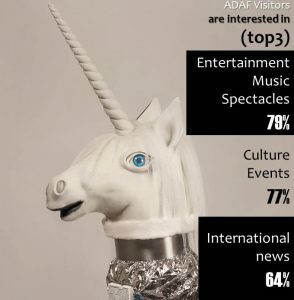 The survey by Focus Bari highlights the main trends of the Greek public, opening up new roads in the cultural industry. In addition, on the occasion of the above survey, we also present you the recent “Study for the Mapping of the Cultural – Creative Industry in Greece” by the Ministry of Culture and Sport, which was drafted by the Institute of Regional Development of Panteion University, in which we had the honor to contribute. Focus Bari is a leading market research agency, boasting a 29-year successful operation in the Greek market, a wealth of experience in the areas of Media, Advertising, Technology and Telecoms, and enjoying international reputation in its specializations. Focus Bari offers tailor-made solutions that help its customers grow through growth of their own Customers’ Experiences. Adopting a 360-human-centric approach, Focus Bari deploys its know-how and expertise in human behaviour, insights and behavioral economics in combination with adequate tools and models, to support business customers in maximizing their results.